Luckily, they've all had his back in his new ship deck by the bay. They , along with other hired help, have helped Luffy defend the One Piece over these sixteen years. Each have moved on and had their own children, and are all about ready to retire their professions on to their children. Luffy's Daughter has taken over the Straw Hat Pirates, and her younger brother , a hearty technician, has revved the ship up with new technical advances and patches. Macaw (Luffy's daughter) must work to make a whole new crew out of new and old friends and protect the One Piece. Can they find a safe place to live? Now, all that's needed is that crew. Please fill out Private message me which you'd like to be. Mind you, there are no Cannons, so all of these characters are original. Your character may be a child of the original cast, or an entirely new character all together. Your choice. Please PM me their parents , and which position you'd like. First come first serve. Macaw yawned, her head bobbing with the expression of early rising ceased. She stretched her arms back, causing her shoulders to crack lightly. She popped her knuckles, wrists, and toes, hopping up from her hammock and taking odd, blocky bounds to her dresser. She clothed in the usual--short, jean shorts and a navy vest, much like her fathers red one. She threw on his old straw hat, which fit loosely on her head and slid from side to side as she walked. He short, shaggy black locks batted at her eyes lids and lashes as she moved. She pulled her lower lip over her upper, huffing her breath up at the bangs to move them. They rose and fell back in place. She frowned. She dramatically opened the cabin door of the ship house, which led to the hall, which led to the den. She followed it down into the main room and plopped herself on the couch, flicking on the TV. Her feet rested themselves on the rickety table before her as she sunk in the patchy couch (which surprisingly was very comfortable) and yawned again. Then time seemed to stop and she jolted forward, removing her legs from the table. "Brain fart!" She hollered, holding up a finger. She'd just remembered today was her day of setting sail-- She and Nakiie were going to find themselves a crew. Just as she was recalling, who would enter but her beloved little brother. He rolled his eyes. "Brain fart? What the. . .?" He stopped himself, grunting. He walked over to the couch, bending a bit backwards and ifting a leg to shove his sister aside and off the couch. She face planed on the carpet with her rear in the air. He grunted again. "Please stop acting so immature." He mumbled, pulling a comb through his hair. It didn't help the scraggly-ness of it. He sighed. He pulled his belt and shirt from the to-be-folded laundry pile which Macaw had sloppily left lying around. He slid the half-sleeved collared shirt around his arms and buttoned them in the front. He ran his hand through his hair. "Oi. Get up. We're goin', now." He sighed. Macaw rumbled something under her breath before jumping to her feet and bumping her brother out of her way and racing through the door and up the stairs to the deck. She smiled a smile ear to ear, much like her fathers great smile. "Alright! Let's do this!" She laughed from her belly, and spun on her heel, waiting for her brother to come up. As soon as his feet touched the deck, Macaw gave him a mere thumbs up as hustled to the Crows Nest. Nakiie used a pulled to lower himself to the oats side, assuring its few weapons were in place. He then raised himself back up, and headed to the boats third level through a secret passage in the floor boards. There is where he started the engine and stocked it of all nutrients it would need to run for about three months or so. When Macaw reached the Crows Nest, she used very little strength to climb it, though, like a macaw bird, she used her mouth as well. She was a strange sight to see, but it didn't bother her. It bothered her mother, though, who was sailing up o wish them farewell in a small haul boat. "Be a lady," her mother continued, "And if you use your mouth, you'll get splinters on your tongue. And please wear some shoes." Macaw rolled her eyes and flexed her toes. "It's not as easy to climb that way." Her mother latched the sail ship up, and climbed the boats side ladder to deck. "Well, I did it when I was your age." 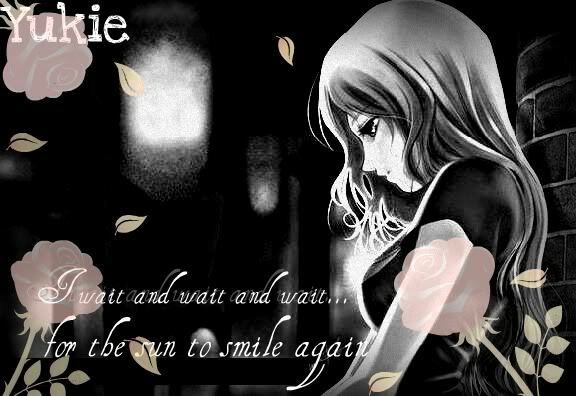 Nami smiled. Her son arose from the deck, black with the grunge and grease of the engine. Nami took the handkerchief from his pocket and whipped it across his forehead before kissing it gently. Macaw slid down the rope, burning her hands a bit. Nami embraced her, then Nakiie. "Good luck, you two. I know you can do it." She smiled at her children who smiled back, and Macaw offered her a dramatically large thumbs up. Nami hugged them each once more, then told them their father would come out later, so they had time in the city before they left. "Your father is coming out later, so you have time in the city before you leave." Nami smiled. She winked to them both, back up and disappeared over the boats edge. "Love you guys! Good lucks!' She hollered from the sail ship. Then she started the engine, and off she went. Macaw leaned against her brother. "Sure thing short-stack." She became as flat as a plank. . . then broke into a fit. "I'M NOT SHORT!" She hollered at the top of her lungs, seeming to shake the whole ship as she stomped to ad up the Crows Nest. So far, this look liked it would be a fun day. Time of day: 6:12 A.M.
Hotaru woke up to the bright of the noon sun streaming through her window. "Mmmm..." She moaned as she rolled over. As she did, she rolled off her bed hitting the wooded floor with a low thud."...Ow... "she said while untangling her legs from her sheets,she got up not bothering to put them back on her bed. Still in her PJ's and half asleep,she stumbled into the kitchen to make herself lunch, or in this case breakfast.Choosing cereal, she went to the living room and sat down on the couch next to her brother, Haruto. " 'Bout time you got up i was worried that you died or somethin'." He said with a half grin. In reply Hotaru smiled and chewed her cereal. After a few more bites and nothing being heard except her munching she asked, "Where are mom and dad?" Haruto gave her sideways glance and said, "Mom is out back and i think dad is still asleep." "Oh OK then." When she was finished eating she went back up to her room to get dressed and groomed.In her room she picked out a long sleeved lace up white shirt and black denim shorts with a chain hanging at her side that goes down to the middle of her thigh. She untangled her long tealy green micro braids and brushed out her bangs. "Hotaru,hurry up! We're going somewhere!" Her dad yelled pounding on her door. "Alright dad!" She yelled back. She slipped on her dark green boots and headed down stairs to see her father, and brother waiting at the door. "Where are we going?" Hotaru asked. "To see an old friend." Her dad replied. "OK but why are me and Haruto going?" "It's...a surprise." He said with a tinge of sadness.Hotaru notices this and was a bit suspicious but she didn't pry. Her dad said that their mom was going to meet them there and then they were on their way down the street toward the harbor. Something exciting was going to happen today.Hotaru just knew it. Dylan Diedrick ran through the door of his older sister's room. Springing on the bed he began to yell. "Diana!! Delany!! C'mon guys! If you're late to work again dad's gonna fire us all!! C'mon! C'mon! Get up!" Diana and Delany Diedrick, a set of identical twins, sat up and rolled their eyes in unison. They shared a glance, then turned back to Dylan. "GET OUT!!" They screamed. They shoved him off the bed, then sprung up to shoo him out the door, but he was already gone. Ah, the Diedrick Darlings. You don't mess with them. Behind all their charm is, eh, fire arms, and lots of them. Diana locked the door as Delany got their attire out of the closet. It was the same usually. The both wore short black skirts, red suspenders hanging off the backs down to their knees, black boots reaching the half way point between their ankles and their knees, white knee socks, and a white tube top, neatly tucked into their skirts. The two quickly changed clothes. They pulled identical brushes through their identical bright red hair, hovering in between their chin and their shoulders. They strung black head bands into their hair, their long side bangs sticking out. The only difference in their hair was the part, which was on a different side of each girl. The two girls slid black hoops into their pierced ears. The two began to cake on makeup, part of the job of a bartender. The locked on their belts, resembling key boards, and looked at each other. They began to tweak each other, making sure they were perfect. "So." Diana said. "You gonna talk to Nakiie or what?" "No way. I'm not you! No matter how similar we look. I can't just go waltzing up to guys because I think they're totally cute, and funny, and smart, and . . ."
"DELANY!" Diana said giggling. She turned around and opened the door to a Dylan, grinning ear to ear. "Delany and Nakiie, Delany and Nakiie!" He sang. "Shut up!" The girls said in unison, pushing over Dylan as they ran to the bar down stairs. "Where are my girls?" One of the men called. "Here we are!" They said running out and wrapping their arms around him like snakes around their pray. "And how are you today?" Macaw gawked at her grunge-covered brother. "HA! YOU LOOK RETARDED, NAKIIE!" She nearly fell on her but, her body curling as she clutched her stomach and laughed. He rolled his eye, swiping some of the blackened grease from his brow and dragging it along her face. Her laughter stopped, and she froze. "EW! THAT'S DISGUSTING! KEEP YOUR GRUNGE TO YOURSELF!" She stomped, clutching her hands into balls and flailing. Nakiie huffed. He rolled his eyes, walking over to the pulley systems which were holding up two row boats. "I'm heading to land. Gonna buy us some more preserves for our journey. Plus I've got some goodbyes to offer. I'll be back in a few, Macaw." He untied the boats hold, gripping the rope in his hand. He let it go, his hazel orbs of eyes tracing its movement up and over the boats edge. Water kicked at his face as the boat made a tremendous splash, and he followed it, using the same hold to swing down on board. "See ya in a few, sis!" He hollered, cupping his hand over his mouth to make his voice larger. She stuck her hand over the boats edge and made it move as if it were a talking sock puppet, mimicking his words. "Ha ha. You're hysterical." He sighed, yelling up at his sister. He spun the oar in his hand, then sat on one of the three benches and began rowing. Upon his arrival at the shore, Nakiie strapped the boat to the deck. He stepped on deck, and made his way from the bay into town. He Arrived at the Beer and Boar Bar which was place in the center of the town. It was very, VERY populated, but Nakiie knew it well. He used to be a delivery boy there. He walked in slowly now, making his way through the rumbling crowds to the bar side. "Oi! Mr.Diedrick! Gotta talk to ya for a second." He waved two fingers to catch the bar owner's attention. They were old friends, and he often would chat it up with the old man. He smiled a warm, broad smile as his friend neared. Macaw had crawled up the crows nest again, and, like her mother had predicted, she'd gotten splinters in her tongue. She clasped her hand together, flicked her tongue about, then lifted one hand to shield her eyes from the blaring sun, peering out over the bay and town's area. She saw a small huddle of three people growing larger and larger, headed toward the ship yard. She smiled. They all had that same teal hair. It had to be Zoro. She grinned, brimming with glee and waving a had ferociously at the sky. "HEY! ZORO! HOTARU! HARUTO! HEY GUYS!" She giggled, jumping up and down as she clung to the mast. "Hey!" She giggled again. Luffy looked out his window. He saw Macaw jumping and Nakiie leaving, and he figured--no, he knew-- he was doing the right thing. He smiled them smile which he'd given to his daughter. He looked up at the billowing rolls of clouds. "You can do it, my girl. My boy. I know you two can do tis." He muttered. He reclined in his recliner, looking up at the ceiling. He inhaled through his nose and the world spun. Could they do this? Would he ever see them again? Was this the right thing to do? Yes. Yes, yes, and yes. He knew it. Tia Tia brushed herself off and adjusted her hat. She hiked the maroon backpack up higher over her small shoulder, and took off for the harbor. She was going to do this. She was going to be the best Straw Hat Pirate's witchdoctor there ever could be. She smiled , giggling as she neared the ship-- more, and more, and more. Tia arrived in a flash--having been gifted with her fathers speed-- and looked up at the great ship. She felt small, given she was VERY small, next to this ship. So she was almost twice as small next to the ship. She blinked. "Ooooo boi. This's gon' be cray-zay." She bit her lip. Because she was right. This was going to be crazy. This was all going to be crazy. Time of day: 6:37 A.M.
"Guess i should go meet them now." Vivi said to her self.She got up from the bench in her back yard and walked to her room.When she was in there she changed into a simple outfit of a white t-shirt and jeans.She trotted down the stairs to the front door.After slipping her sandals on, she began to walk out the door but paused when she was in the door frame. *sigh*Yes they can do this... Vivi smiled and made her way down to the harbor closing the door behind her. Zoro walked with his two children down the hill to the harbor and his son, Haruto,being overly curios, kept asking him what the surprise was.Being used to this, Zoro didn't get irritated as you might think. "Can't you wait? I'll tell you soon we just need to get to Macaw's ship." Again Hotaru was kind of suspicious of course, but again, unlike her brother, she didn't pry.It would take them at least 15 minutes to walk down the hill to the harbor and in that time Haruto thought about what she was gonna say to Nakiie,her crush.She realized that she liked him about a month ago. When they were close to the harbor Hotaru heard her best friend Macaw yell her name and she said, "Hey Macaw!" and ran toward her ship with her brother following behind her. "Oi! It's old Nakiie come to visit his old boss! How are you lad!" Mr. Diedrick yelled over the crowd, pulling Nakiie behind the bar, the only place where there weren't people flooding. "Diana! Delany! Look who's popped in!" Mr. Diedrick placed a hand around Nakiie's shoulders as the girls arrived. The two identical twins were now easy to tell apart by the redness of Delany's cheeks as Nakiie came into sight. The twins stood in front of him and leaned on each other as they often did. "How are you today?" They said in their typical unison. Diana's voice was more clear, seeing that Delany was shy as a mouse around Nakiie. She had a MAJOR crush on him. "Hear your off on a voyage." Diana said. "No kidding. We have to stick around here washing dishes and handing out drinks . . ."
"What was that?" Mr. Diedrick asked eyeballing the girls. They looked up and stopped leaning on each other, standing straight as a pair of identical boards. "Nothing!" They chirped. All of a sudden they both hit the floor as a beer mug crashed on the wall above them. Diana and Delany jumped up on the bar, pulling pistols out of the holsters on their sides. "Who threw it?" They yelled. "You? Get out!" They yelled, leveling the pistols with the old mans head. He scurried out the door. Diana jumped down and helped Delany down. The twirled the guns on their finger before blowing at the barrel and sliding them back in their holsters. "And stay out." Diana said, high fiving her sister. "If only we had some REAL target practice." She sighed. She linked arms with Delany. The two stood, arm in arm, looking at Nakiie, smiling. Man, how long had it been since he'd come round here? Nakiie patiently watched the events unfold around him, before continuing to speak. "Well, that's what I came to speak with you about. We're low on crew members, andI was wondering if either the girls or Dylan would be interested in, eh, joinin' us." HE leaned on the bar, curiously looking up at the old man. He peered over at the girls, blushing as his eyes met Delany's for an instant. He hacking into his fist, then shoved it into his pocket. "Erm, eh, hey, ladies." He flashed three fingers in a friendly wave. His eyes met Delanys again, and he blushed, then waved a bit, then returned his eyes to her father. "It's entirely your option. I understand either way." He nodded once, then waited patiently for the reply. Macaw threw her arms around Hotaru. "HEY!" She smiled and laughed. Then looked to Haruto. "Hey there!" She smiled her grin, widespread and goofy, to him, pulling him into a hug soon after his sister left one. Macaw giggled, ruffling Haruto's hair and punching his shoulder. "We're shipping out today, you know." Her smiled wavered. "I'm lad you guys stopped in. Gonna miss you both." She smiled. . . The suddenly there was a streak of chocolate fur, which flew through the sky and latched onto Macaw's head. "EH!? TIA!? WHY'RE YO HERE!?" Macaw flailed in surprise, falling on her back and rolling. Tia poked her nose and knocked on her head. "I'm da new witch docata' here on board." She smiled a kitty grin, clasping her little hooves in front of her. She closed on eyes, grinning a wide grin. "Cho yah, Missus!" She punched Her friend who continued rolling on the ground. Macaw stood, smiling down at her. She then looked to the siblings before her. "If only you guys could come to. That would be awesome!" She frowned. "If only, if only. . ."
"I'm great thanks! How bout you, i heard you are setting off today, is that true?" Hotaru said giving Macaw her puppy eyes. "Yeah, are you? "Haruto said,"I was hoping to hang out with Nakkie a little while more." Hotaru sat down on the deck and said,"I wish we could go with you." Zoro caught up with his children and found Macaw getting jumped on by Tia.He laughed and went to greet them. "Hey Macaw long time no see!" Giving her a hug as he said so. Vivi was sitting on a bench in her backyard, absentmindedly rolling a leaf around her fingers. Will they be able to do this? The girls shot a glance to their father. He smirked. "You may go . . . Protect yourselves." The girls automatically knew what was meant. They smiled at each other and without a word and almost soundlessly, upstairs. Dylan soon emerged from the kitchen. "May I go too, father? Please!" He pleaded. "No I'll need you here." "But, father - " Dylan was cut off. Diana and Delany had returned. Each girl had a machine gun strapped to their backs, a pistol in each boot, three more attached to their belts and a small revolver at the small of their backs. Dylan was sulking in a corner. The girls hugged their father then turned to Nakiie. "Lead the way!" They laughed in unison. Being snipers, guns were their best friends, them not exactly being the friendliest people. "Well, then , come along, I guess." He smirked, beckoning them to follow. "Oh." He stopped himself, and bowed at the waist to there father. "And, if it's not a hassle on your part, we would be willing to take your son off of your hands, too." He smirked, Looking at the boy as he frowned, cleaning up. "Yes! That's it! You two should come with me! It's perfect! We'd have so much fun, and we'd make a great crew! What do you guys say!?" She clasped her hands together and bounced on her toes. "Eee!" She shreed, clapping her hands. "Mm-hm! Let's!" She smiled, and offered a thumbs up, clopping down on all fours and scampering off, below deck.